So due to the length of this post I decided to break it up into 2 parts. Part 1 covers why I decided to make a reproduction, and touches on the research and design aspects of the project. At the end, I do answer our most asked question. Part 2 will cover the actual build process where I will try to explain the how and why of building what we call the Legacy. 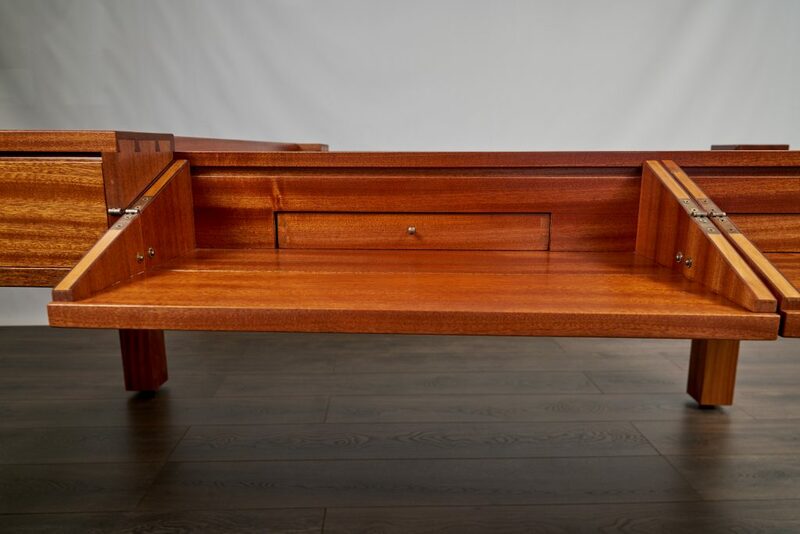 As a furniture maker it is not uncommon to get asked to create a reproduction for a customer. 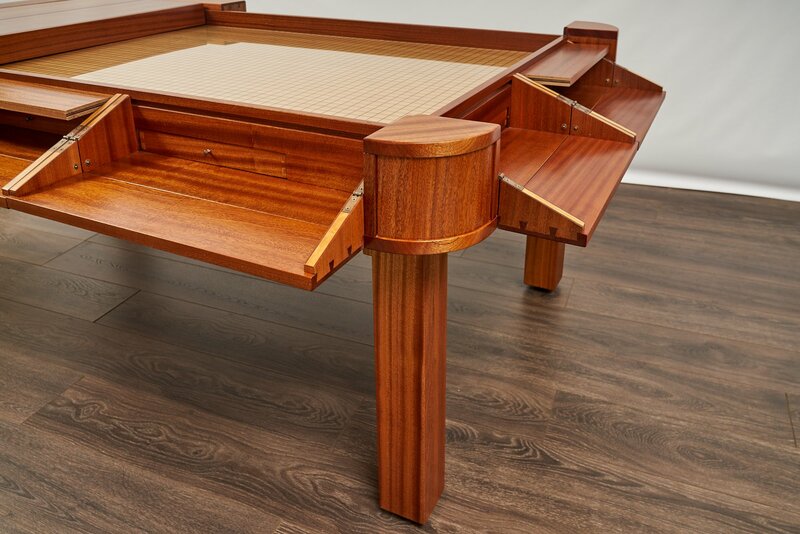 So with Geek Chic going out of business and Uniquely Geek being the only fully custom gaming table manufacturer, I guess it was inevitable that we would be asked to reproduce one of their tables. Like nearly every furniture maker I would rather make our own designs but in this instance I felt like it was the right thing to do for the community. Many people that had their sights set on getting their dream table and were devastated by the news of Geek Chic’s closing. Some not only missing out on their dream but thousands of dollars along the way. So when I was approached by several customers interested in a reproduction of the Vizier I made the decision to fulfill their dreams. Of course we could not call it the Vizier so in honor of such a great tradition we decided on calling ours the “Legacy”. The Vizier was one of Geek Chic’s most popular designs and reproducing it would be a great challenge. Any great reproduction always starts with research, and there are several people that helped me with that, including Mark Hanson. If you have not read his game room blog you should, you can find it HERE. The others will go unnamed but you know who you are, so Thank You All Very Much. While doing my research one of my goals was to find out what current owners felt were the obstacles or opportunities with their tables and what they would change if they had the chance. After all, if I can improve on a design and create a more enjoyable experience for a customer why wouldn’t I. As expected there were very few complaints but the ones that did come up I was able to solve during the design phase of the Legacy. Compare to the picture below, you will see the continuation of the grain pattern throughout the entire piece. 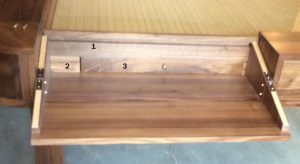 I felt this was a very important design aspect that warrants the extra steps involved, especially in highly figured grained woods like this Sapele. The next design consideration I took into account were the proportions of the fold down playstations. The original table had unequal width playstations and depending upon which size you chose the differences in widths would be dramatic. I am not sure why it was this way but it was probably to standardize the parts involved and simplify production. The original table also had a different depth for the end playstations than the side playstations. To me this gave the table a feeling of unevenness when all closed up. I made the desition to produce all of the playstations at the same depth and equal width down the sides and at the ends. This gives the table a better balance without sacrificing the gaming functionality. Besides a couple of small hardware improvements there really was not much more that needed to be changed. Again this is a testament to the great design of the original table. 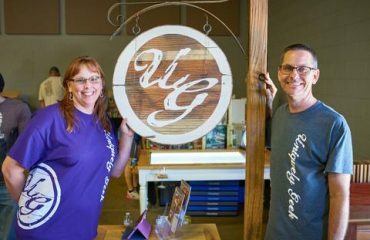 The original intent was to only produce a few tables for the customers that never received their table from Geek Chic. After the word got out I started to receive several inquiries regarding the Legacy. I mentioned at the start most furniture makers would prefer to make their own designs but I have prided myself on listening to our customers. 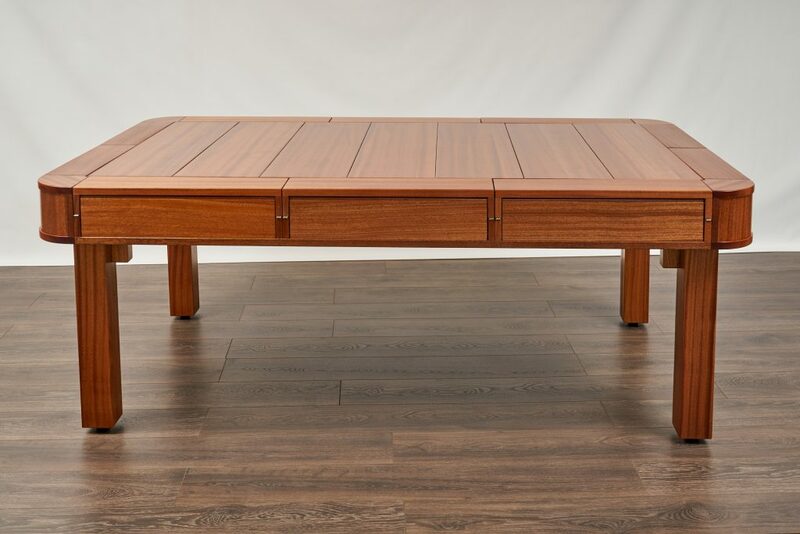 Knowing that this table is not for everyone and is above our normal price points I have decided to offer the Legacy in limited production runs and will continue to produce it until the demand dies off. So for those of you that have been waiting for more information on the production here you go. Production will be 3 tables at a time, twice a year for a total of 6 tables a year. The first production run will begin on 1/1/2019 and subsequent runs will start every 6 months thereafter. With all the intricate work and individual customization of the Legacy table, production time will be about 3 months. All production slots will be first come first serve and will require a $1,000 refundable deposit to reserve a production slot. Pricing will be as follows for base woods with our typical upcharges for wood species and finishing staying the same. Every table comes standard with; matching game vault floor, a clear wet/dry erase acrylic sheet, 2-sided game vault insert, 2 leaf guards, 1 cup holder per playstation, leaf cube, and a personal designer (no you don’t get to keep the designer). (Table Top Length in inches) x (Table Top Width in inches) then divide by 144 = (x) Sq.Ft.. then plug that number into the chart above to get your base price. We will get the deposit up on the website next week but feel free to E-Mail me if you would like to lock in a production slot before then. As always feel free to ask any questions or provide any comments. – If we want a different arrangement for the foldout station in the end of the table (GM Station), is it manageable? For example a the same arrangement as the others with a bin or a dice tower next to it with a lenght of let’s say 3 feets total instead of the classic 2 feets. I mean is it possible to submits some 3d plans to the personnal designer to see if it’s manageable (small tweeks not a total change in the table of course). – Can this table be delivered in Europe? Of course all the questions i ask are not for the same table but everyone can have a specific feature he absolutely want on the table. 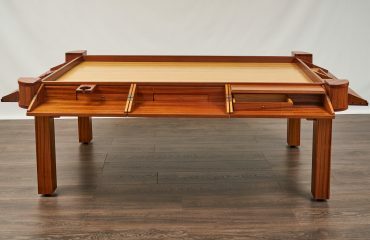 Great questions and thanks for the interest in a Legacy gaming table. I will try and tackle them one by one and dive a little into the why the things are the way they are. Never tried to max out the weight capabilities on a foldout, but by the nature of their design they are pretty sturdy. When the station is open there is wood to wood contact for the width of the station which takes all the pressure off the hinges. Also the sides are dovetailed into the fold down portion so that would not be a weak point either. So the only way for there to be a failure would be if the hinges screws were to pull out or get sheared off. I am not saying you could stand on it but I would feel pretty confident in a fold down being able to support 80-100 pounds. The foldout stations are 12″ deep when folded down. 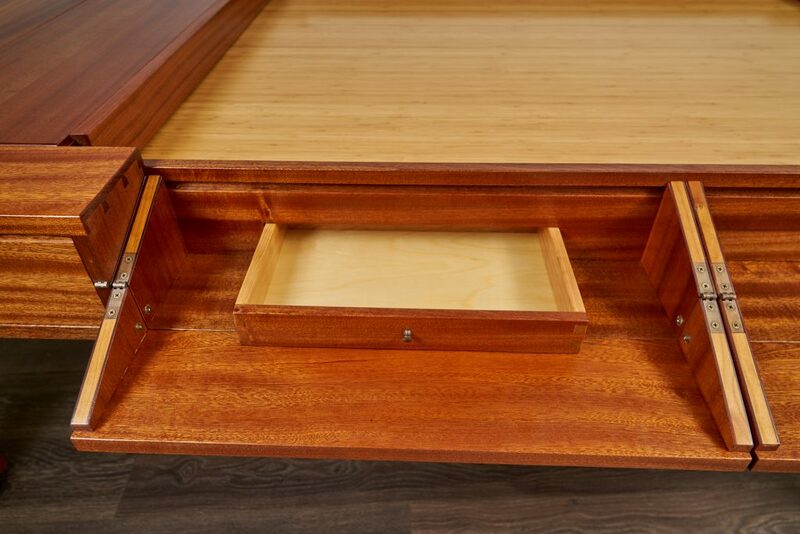 A 3″ deep game vault is possible but the extra depth would have to come out of the drawer height. Extra depth = shallower drawers. We are still a 100% custom furniture maker so we can make whatever changes a customer wants. The nature of the Legacy table is that it is designed to be very modular, Geek Chic did a great job on that with the Vizier, and there are several ways to incorporate what you are looking for into a GM station. There are no fixed sizes for our tables. That is one of the features I wanted to keep true to our philosophy at Uniquely Geek. So the foldout station width dimension is based upon the customer decision on table size, not the other way around. Yes, storage in place of foldout stations is not a problem at all. Also they can be used to accommodate certain table sizes where 2 fold down stations would be to large and 3 fold down stations to small. Yes it can be shipped to Europe. I think that answers them all but if I missed something let me know. The demand for the Legacy table has been much higher than I ever expected. We are already booking into next year with only a few slots left. 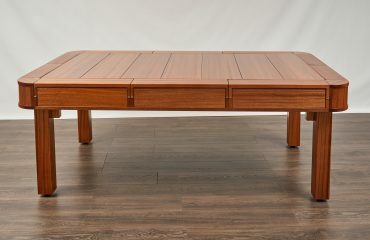 With the demand being as high as it is I might have to reconsider my commitment to only make six Legacy tables a year. Thanks a lots for your amazinly fast answers. The waiting is the price to pay when you want very good furnitures (especialy custom ones). Maybe the interrest in the Vizier is due to the lack of true alternative for a few years. So it might settle a little in a few years and you might be ok with 6 a year. You might also want to consider having a reservation calendar (for example, someone alredy knowing he want a Legacy in 2/3 years after a house construction or something). Stay updated on our latest designs and offers. © 2018 Data Driven Marketers | All rights reserved.